On August 10, 2016, members of the Newark community gathered to meet Peter Harvey and members of monitoring team for the Newark Police Department. 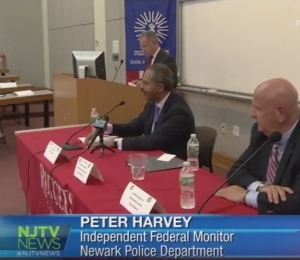 Click on the above video for the NJTV News coverage of the meeting. Peter Harvey is a past Attorney General of New Jersey and a former federal prosecutor. As such, Peter has been a central player in civil and criminal trials, government investigations and consumer fraud matters for many years. A gifted trial lawyer, his nearly 30 years of courtroom experience includes significant commercial matters, frequently within the hospitality, pharmaceutical and entertainment/sports industries. Mr. Harvey was nominated to serve as independent monitor for the Newark Police Department, responsible for overseeing the NPD's compliance with a Consent Decree issued by the U.S. Department of Justice. He also currently represents corporations and individuals in business disputes throughout the nation. He has tried several major civil and criminal jury and non-jury cases in federal and state courts. He also conducts internal investigations for senior executives seeking to learn facts about employee misconduct or inappropriate business practices. Mr. Harvey also assists clients in navigating Grand Jury Subpoenas and government Civil Investigative Demands. He works with clients to develop strategies to achieve the client’s desired result, whether through trial, court decision or settlement. Defending a major art dealer against breach of contract claims. MEMBERSHIPS: Member, National Association of Attorneys General (NAAG), Representative to the Executive Working Group on Prosecutorial Relations; Chairman, NAAG Subcommittee on Gang Violence; Chairman, NAAG Corporate Responsibility Securities Working Group; Member, NAAG Task Force on Youth Access to Alcohol; National Bar Association; American Bar Association. HONORS: “Distinguished Leader,” New Jersey Law Journal (2017); “Most Influential Black Lawyers,” Savoy Magazine (2015); “Private Practitioner of the Year” by the Metropolitan Black Bar Association of New York City (2012); “100 Most Influential Black Americans,” Ebony Magazine (2005); “Top Black Lawyers in America,” Black Enterprise Magazine (2004); New Jersey Law Journal’s “Lawyer of the Year” (2003); Recognized in Super Lawyers in the area of Business Litigation.